Nish Taank, owner of the new drycleaning business in Churchfield Road, has Acton in his bones. He is the son of Arun and Neema Taank who run the invaluable Churchfield Road Post Office. Arun and Neema Taank have run businesses on Churchfield Road since the 70's when they took over the Post Office. 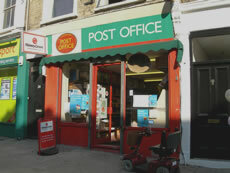 Later they ran Londis for 19 years, but the long hours drove them back to the Post Office. Nish was a pupil at Southfield School and then went to Twyford. He then studied Business and Finance at (in those days) Ealing Tertiary College and got a job in the City in corporate banking where he worked for 9 years. He told us: "I had a really good job, but my heart just wasn't in it. I was working 60 or 70 hours a week and just didn't enjoy it any more. I thought to myself, 'I've got to stop moaning and do something about it!'" The decision to leave a well-paid job wasn't an easy one. "My boss made it harder for me by offering me a good package to stay." But Nish was determined and his boss obviously doesn't hold it against him as he turned up to the launch party last night. "The process hasn't been as easy as I thought it would be. It took five long months to get planning permission. Various departments at Ealing needed to be involved. The Planning Department took a little longer than I felt they should have done." However, he feels the four month wait has allowed him the time to get things right. Nish has plans to make Pearls a little different - a couple of notches above the average dry-cleaning business. He is introducing a loyalty card scheme, with an express counter service form which people can fill out themselves to save time if they are dropping clothes off in a hurry on their way to work, and a text message service to let customers know when their clothes are ready. Many ActonW3.com visitors will be pleased to hear that all the machines in the shop are brand new, low emission and as green as they possibly can be. The business will dispose of chemicals safely, encourage customers to recycle packaging and re-use hangers and bags. Nish is full of hope about his business. His optimism seems to be well-placed. It was difficult to interview him on his first morning as a continuous stream of customers arrived with clothes in need of a good clean. He also says: "I hope my shop opening will encourage others to fill some of the vacant businesses on Churchfield Road. The empty shops here bug me. I want to do my bit to lift the area and hope that my shop opening will have that effect." 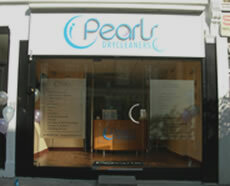 Pearls will be open during the week from 7.30am.